-We have a new offer of 3 nights B&B with one 3 course evening meal for 2. -We still have our popular 2-night stay with B&B and 1 evening meal for 2 price 110€. McClaud Pub presents Willie & the Inmates: Saturday 13 APR 11pm. Action for Animals Quiz: A huge thank you to all who attended our quiz at Bar Cerezo in Canillas de Albaida on Wednesday. We raised the amazing sum of €390! The next quiz will be on Wednesday 15th May, booking details to follow later. See you there. Thanks, Megan. This Sunday we are joined by the one and only Ella Hillier and her fabulous music some covers and some of her own songs. Sit in our wonder full garden and enjoy our home made buffet that consist of a minimum of twenty five lovingly prepared dishes includes a selection of meats, vegan, vegetarian and gluten-free options, don’t forget to leave room for our ultimate sweet table! All you can eat for 15€ ! GU!R! LIVE: Saturday 20th April from 20:30h at Bar Atila in Puente Don Manuel is GU!R!’s first date back! Come and enjoy the fabulous food and friendly atmosphere at Atila’s with plenty of room to kick up your heels and boogie. To book a table call 630 393 290, or for more information contact https://www.facebook.com/GUIRI.rock.band/. Leave Spain 6th May – Arrive UK 8th June. Removals & light haulage company that have scheduled trips from UK to Torrox and back at approximately the same time every month. We can add or amend these dates if viable. Wood Fired Oven Cookery Course: Join us in a superb mountain location in the Alpujarras for a full one day wood fired oven cookery course. Great ‘hands on’ experience using a large wood fired oven. We will be cooking a variety of food, from bread and sweet dishes to baked vegetables and a curry. The day will include a tour of our garden (also open to the public on Fridays and other specified days) and will culminate with a group meal enjoying the proceeds of our labours. There will also be a little something for you to take home. Cost €85 per person to include all food and refreshments. We have four dates for 2019: Saturday May 11th, Saturday June 8th, Saturday September 28th, Saturday October 19th . Limited to 8 people per course, places must be booked in advance. Great gift idea, or why not make a whole weekend of it and enjoy staying in the marvellous Alpujarras of Granada – please ask for further details. We are located at Cortijo Opazo, outside the small village of Pórtugos in the Alpujarras. For all your local removal needs we have men and vans at your disposal. Whether you are moving home or need a single item moving, then we can help. Need something from one of the big stores in Malaga? Give us a call and leave it to us to deliver to your door. Academia De Idiomas Torrox: We are honoured to announce that we have the sole international accreditation for institutions teaching Spanish as a foreign language. But what does it mean? To be accredited by the prestigious Instituto Cervantes, every center must fulfil requirements that demonstrate the high quality standards demanded. These conditions and requirements include working with the most qualified teachers, having excellent facilities and equipment, and academic activity, among others. Course timetable: Tuesdays and Fridays from 12.00 to 13.00. Are you ready for the next step? Do you know the basics and would you like to learn how to have a conversation with your neighbours? Would you like to get by in daily routines like renting a flat, visiting the doctor,…? Grammar and also conversation are guaranteed in our courses. Learning Spanish can be fun and educational! Friend finder: Hello, I am new to the area so would like to submit an ad for dating/activity partner. Looking for female for dating or activity partner in the Torrox area. I am late 30 fit and healthy, looking for someone similar. Please supply a photo if you are interested to meet-up and I will do the same. Our meetings are characterised by uplifting songs and relevant sermons and a modern but reverent service, followed by free tea or coffee & biscuits. Why not come along and make new friends, every Sunday at 10.30am. 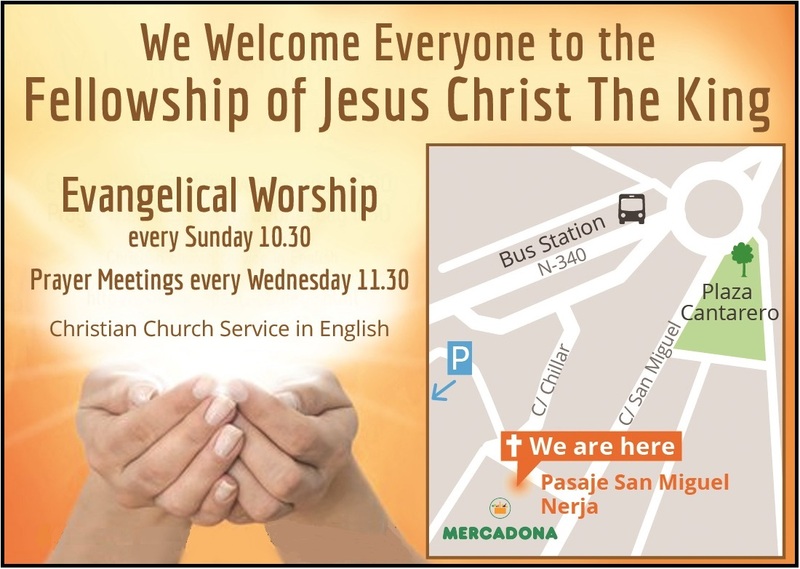 Also Prayer meetings every Wednesday at 11.00am.